Where are we today with machines like the Krups FSC112 juicer? Juicers are getting better and better looking with time. What started out as a simple hand crank to get the juice out of oranges and other fruits for breakfast has turned into a booming market with sleek, modern machines that deliver pulp-free juice at lightening speed. When you read Krups juicer reviews it is easy to get confused. One reviewer talks about completely pulp-free juice while another notes that there is some pulp in the juice most of the time. One seems pleased with their Krups juicer after many months of use while a few others complain that their motor gave out after just a couple uses. You can gain a lot of information fro consumer Krups juicer reviews, but you have to put things in perspective and know what you are buying. That’s where this review comes into play. Let’s sort it out and learn all about the Krups FSC112 juicer including the good and the bad. 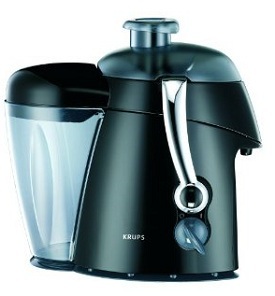 This Krups juicer is very attractive with its sleek black housing, stylish design, and silver juice container. You can set this juicer on your counter and it will blend right in with your other appliances in a nice way, especially if you have a lot of black in your kitchen or use it as an accent color. Yet, you purchase a juice extractor because you want delicious juice, not because you need an accent color for your kitchen. 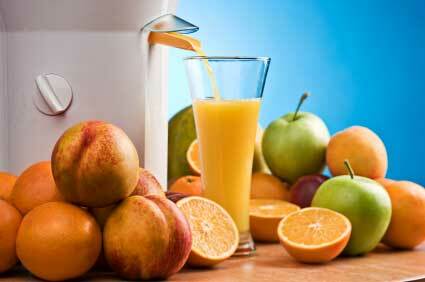 The benefits to this machine are the generous sized juice container and the ability to separate foam from the juice. This ensures that more of the juice you produce will be usable, since foam can often ruin an entire container of juice. This is an easy-to-use machine that will deliver nearly pulp-free juice. There may be some pulp in the final product sometimes, but it probably depends on the type and amount of fruits and vegetables being used. This is why some reviewers claim the juice is completely pulp-free while others disagree. The fact that some pulp may get into the juice is seen as a negative to some users while others wish there was a way to set the machine to include more pulp. This is a battle that you can have with any juicer. It’s all a matter of perspective. The biggest potential problem is that the motor sometimes gives out rather quickly. Even if this occurs within the first year under the warranty, you will have to pay to ship the machine back and then it may or may not be covered under the warranty. There are many other pretty juicers on the market and many have more durable motors. Shop around before settling on this Krups juicer. Compare to other popular juicer ratings.